Mango Cucumber Salsa is a delicious side, variation of ever so famous salsa prepared using fresh cucumber, mangoes, onions, Jalapeños et al! It gets ready in under 10 minutes is great for dipping, topping over grilled meat and fish and in tacos. Here is how to make Mango and Cucumber Salsa Recipe. Turning ON the summer mood is pretty easy! Get a crate of fresh, pulpy alphonso mangoes for yourself and you know that awesomeness is awaiting you this season! From coolers, mango juice, salads till mango based main course like Mango Orange Gazpacho, accompaniments like Andhra Style Mango Pickle, Kairi ka Raita, or a hot Chicken Pepper Mango bowl, my summer menu is all lined up with the best dishes that can be prepared using the king of fruits. As mangoes help in clearing the skin, lowers cholesterol, improves the health of eyes,improves digestion, aids in curing the heat stroke, it is recommended to relish mangoes as often as one can when they are available during the season. 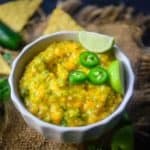 As my kiddo loves nibbling on anything and everything made of cucumber and loves eating mangoes, this time I ended up making Mango Cucumber Salsa which fuses the best of both of them! 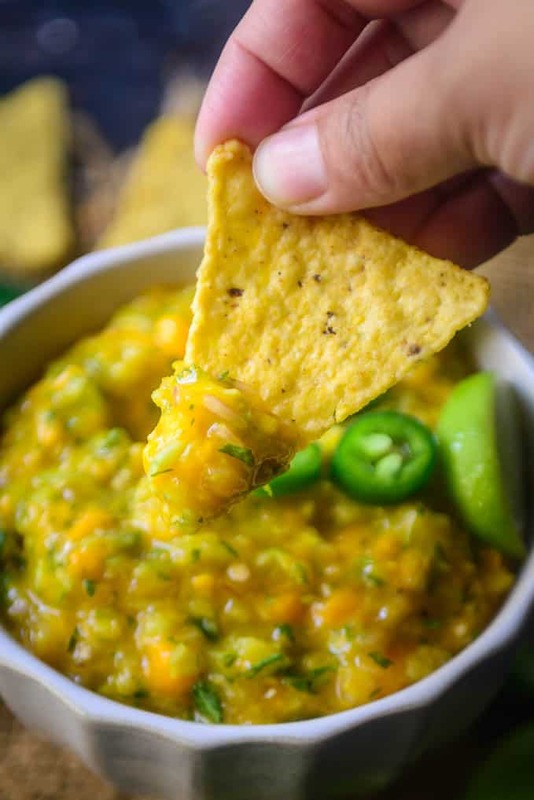 Mango Cucumber Salsa is a delicious side, variation of ever so famous Salsa prepared using fresh cucumber, mangoes, onions, jalapeños, cilantro, lime et al! This freshly made accompaniment can be served with Nachos, Chips and even Khakhra if you like to relish things with a desi twist. I have a lovely grilled Mango recipe too which I will be posting very soon. In case you do not like using cucumber then you may even make its variation like Mango Salsa or Mango Avocado Salsa that turn out equally yummier. Coming to Mango Cucumber Salsa, this one is surely tasty, lip-smacking, so you better not miss savouring it! BTW, here’s its recipe in case you are already drooling! 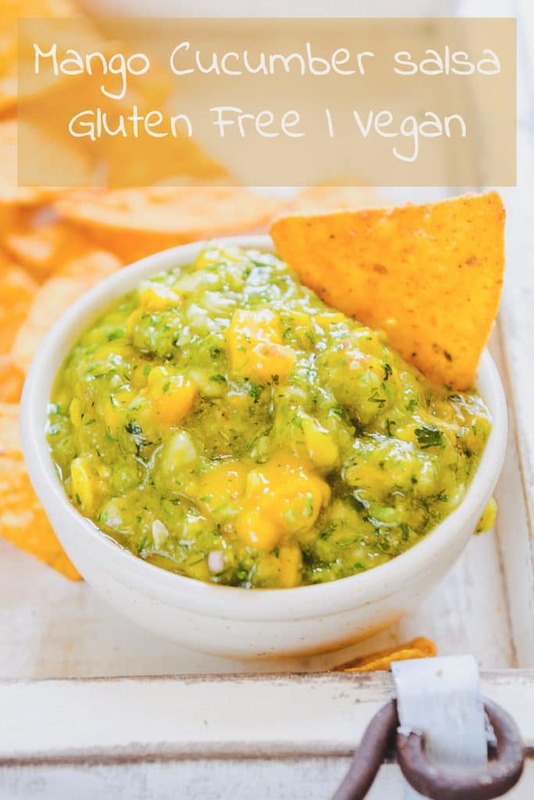 How to make Chunky Mango Cucumber Salsa? You can make a chunky version of this salsa by chopping the ingredients in small cubes and not putting them in a food processor. Try to dice the veggies in equal size pieces. This will give your salsa a neat look. You can use a mandolin slicer to do this job. You can add tomatoes as well in the salsa. If adding, then remove as many seeds from tomatoes as possible. You need the firm flesh and not the juice and the seeds. Salsa tastes best when made fresh. You can let it rest for 30 minutes for the flavours to come together. Add all the ingredients in a food processor. Pulse a few times so that everything comes together. 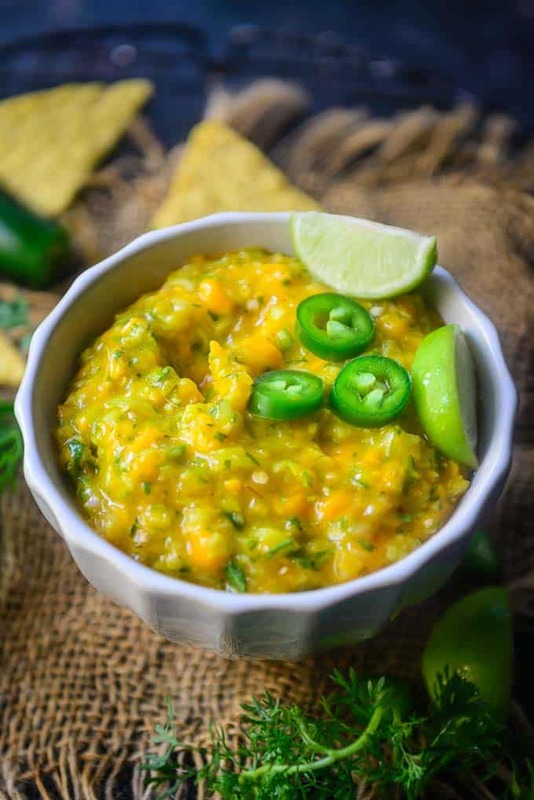 Mango Cucumber Salsa is a delicious side, variation of ever so famous Salsa prepared using fresh cucumber, mangoes, onions, jalapenos et al! Add all the ingredients in a food processor and pulse a few times so that everything comes together. Don’t over pulse other it will become a puree. Serve with chips or nachos.